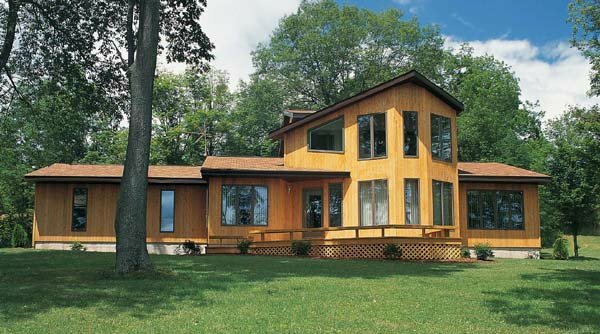 Contemporary styling with shed roof and angled walls courts this streamlined 1778-sq.-ft. design. Special ceilings in the air-locked entry and casual living room rise two stories. The effect is an expansive overview from the master suite which sprawls across the entire second level. Skylights and sloped ceilings offset the new-age kitchen as it eases conveniently into the dining room. Two main-floor bedrooms share a room full bath.